Rabbi who moved into Machpela House with others believes the Supreme Court will allow residents to remain in purchased buildng.. 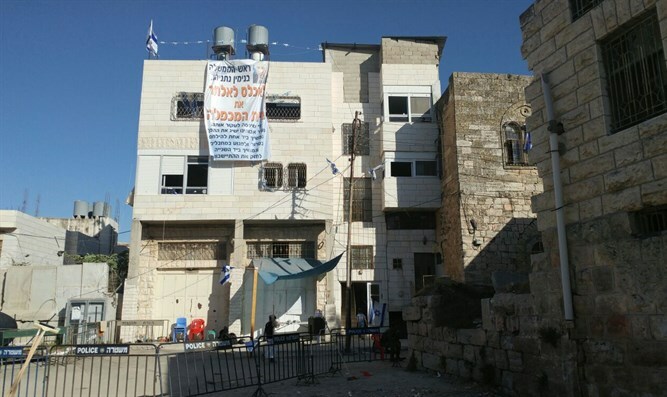 Rabbi Uziyahu Sharbaf, one of the purchasers of the Machpela House in Hevron,is convinced that the Supreme Court will accept the purchasers' petition to be allowed to remain in the building they bought at full price. Supreme Court Justice Neal Hendel on Sunday night ordered the state of Israel to respond to petitions against the eviction of the Machpela House within a week. Hendel also issued an order prohibiting the eviction of the tenants from the building until further notice. "We were not surprised by the Supreme Court's decision. Anyone who looks at the material will see the vast evidence we have, while the Arabs don't have a shred of proof. When a Supreme Court justice sees this, he has no choice but to tell the state to stop the evacuation," Rabbi Sharbaf said. He harshly attacked the Civil Administration and claimed that it is preventing the completion of the process of purchasing the building. "The Civil Administration is unfortunately cooperating with the Palestinian Authority, which is a terrorist organization, so as not to allow the Jews to buy houses," This is not the first time the IDF Civil Administration, which administers Judea and Samaria in lieu of Israeli sovereignty over the region, has been accused of seeing itself as representing the Palestinian Arabs. Rabbi Sharbaf had a clear message for those seeking to prevent Jews from being able to buy or move into houses in Hevron. "You will not be able to stop us from buying houses. We have more surprises for you with regard to homes in Hevron."